Impressed? Wait until you see the before shot. This is what she had to work with! 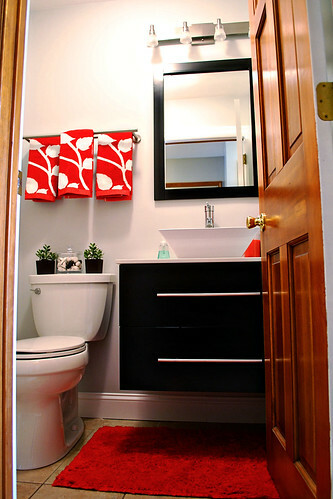 Check out the entire makeover story and find out the sources on this blogpost from bijou lovely. Thank you so much for sharing your lovely bathroom with our Fresh New Spaces Group! This is inspiring! My front bath is layed out exactly like this. I have been wanting to install a floating vanity for a while and now I can see just what it would look like…just as I suspected – awesome! BTW, where ya been? Haven’t seen as many posts or ideabooks from you lately. Been seeing many new faces at Houzz, but my day just isn’t the same without a good dose of modern and witt from my favorite contributor! Hope all is well. The pic on top looks really impressive! Thank YOU HOlly, and congratulations, it looks great! dramatic before & after – thanks for sharing! Looking this and some other DIY projects it seems that professional designers would be out of business if everybody would decorate their homes themselves. A great transformation with that bathroom, makes me want to pick up a hammer and a saw and rush into mine to make some radical reimprovements. Thanks for the ideas! Nice article. In future I want to make my bathroom like this. Its really good and impressive. Thanks for sharing this information. I would very much like to know where you purchased your floating vanity. Thanks! The vanity is from Wayfair.